Fujifilm buyers at the enthusiast/professional end of the market have a quandary. The Fujifilm X-H1 is the camera that Fujifilm has made specifically for this kind of user, with a big, meaty body, in-body stabilisation and a top-mounted status display. But then it launches the X-T3 with a higher resolution sensor, faster processing, better autofocus and better video. The X-H1 still has physically advantages, but technologically the X-T3 puts it in the shade. So we think it's a matter of when, not if, there's a new Fujifilm X-H2… and this is what we predict its specifications and features will be. The existing Fujifilm X-H1 uses a third generation 24.3-megapixel X-Trans CMOS III sensor, but the new X-T3 comes with a newly-developed fourth generation 26.1-megapixel X-Trans CMOS IV sensor. To preserve the superiority of its top range model we'd expect Fujifilm to introduce an upgraded X-H2 model with this sensor and its latest X-Processor 4 image processing engine very soon. The 2-megapixel increase in resolution this sensor provides is not particularly significant, it's the dramatic increase in continuous shooting speed and video capability that the X-H2 needs. This won't just restore its advantage over the X-T3, it will give it unbeatable specifications in the whole APS-C camera market. The X-H1 was Fujifilm's first X-mount camera to get in-body stabilisation (IBIS), and since this has not appeared on the new X-T3 it's going to remain a crucial selling point for the X-H2 and a key reason for many photographers to choose this camera over the X-T3. The system uses three axial accelerometers, three axial gyro sensors and a specially developed dual processor to offer up to 5.5 stops of shake compensation. Even if Fujifilm doesn't upgrade the hardware, it may tweak the algorithms to improve the effectiveness of the X-H2's in-body stabilisation. We expect to see the X-H2 match the X-T3's breakthrough video specifications, capturing both cinema 4K (4096 x 2160) and 4K UHD (3840 x 2160) at up to 60/50fps with a maximum bitrate of 400Mbps and maximum recording time of 30 minutes – that's twice the bitrate, maximum frame rate and recording time of the X-H1. We also expect the X-H2 to offer 10-bit 4:2:0 internal recording and 10-bit 4:2:2 to an external recorder, making it one of the most powerful video recording tools in its market – and a strong challenger to the Panasonic GH5S, which is restricted to 10-megapixel stills. The X-H1 was pitched as a camera for professionals and continuous shooting speed is a key factor here. The X-T3's blistering speed has put the existing X-H1 in the shade, so we expect the X-H2 to at least match it. This means in increase froom 14fps to 20fps in electronic shutter mode, and the likely inclusion of the 1.25x crop mode that appeared on the X-T3, offering cropped burst speeds up of to 30fps. The mechanical shutter continuous shooting speed may stay capped at 11fps, but will there be an increased buffer capacity? The X-H2 should at least match the X-T3's performance, with the ability to capture 145 JPEGs or 42 lossless compressed raw files – a substantial improvement on the X-H1's rather modest buffer capacity. Or will Fujifilm be tempted to go further still and make the X-H2 match the 200-shot raw buffer capacity of a sports specialists like the Nikon D500? We expect the X-H2 to adopt the new and upgraded autofocus system in the X-T3, which is a substantial uprade on the one in the X-H1. We expect it to bring 2.16 million phase detection pixels, which is more than four times the number in the X-H1 and will greatly expand the AF area to cover almost the entire frame. Other AF arrangements are likely to stay the same, with a choice of Single-point AF, Zone AF and Wide/Tracking AF with variable-size AF points and zones. Fujifilm does not usually make great changes to the exterior design with new models, so the X-H2 should retain the handy AF-On button and focus lever of the X-H1. We wouldn't expect any significant changes to the exterior design of the X-H2, since the X-H1's layout is very successful. One of the less obvious areas where Fujifilm has established the X-H1's status over the X-T series is its design and construction, and we expect to see this carried through into the X-H2, with a magnesium alloy construction 25% thicker than lesser models, dust, moisture and low temperature resistance down to -10 degrees, and the same scratch-resistant surface. The X-H1 has no EV compensation dial on the top plate since that had to make room for the top LCD sub-monitor, but that's a worthwhile sacrifice to get the extra information display and an important feature we expect to see retained on the X-H2. There are important physical differences between the Fujifilm X-H and X-T designs which don't appear in regular specs comparisons. One of these is the super-quiet 'suspension' system for the shutter mechanism and its 'feather-touch' action. It's easy to get caught unawares by the lightness of the shutter action in the X-H1, so we hope Fujifilm will tweak this slightly in the X-H2 without completely taking away its responsiveness. We definitely want to see the super-quiet shutter retained for the X-H2. In fact, 'quiet' hardly describes it. It's so quiet you may not actually need the silent electronic shutter mode. Fujifilm uses twin-card storage for the X-H1 and X-T series cameras, so it seems inevitable the X-H2 will have twin card slots too. But what format? We don't suppose Fujifilm is ready yet to take the plunge with the super-fast XQD or CFexpress format just yet and it seems most likely that Fujifilm will stick to the twin UHS II compatible SD card slots in the X-H1. It seems inevitable that the X-H2 will adopt the 26.1-megapixel X-Trans CMOS IV sensor and X-Processor 4 image processing engine of the X-T3, which will the existing ISO 12,800 maximum (expandable to ISO 51,200) will be retained, despite the 2-megapixel increase in resolution. We're not expecting any stratospheric ISO numbers from Fujifilm, a company which is generally pretty conservative/realistic about what sensors can do. This is the one thing we can't predict with any great degree of certainty! However, we can make some guesses based on past Fujifilm announcements, and we reckon the X-H2 could make its grand entrance either at The Photography Show at the UK Birmingham NEC in March 2019, or at Photokina in Cologne in May 2019. Or there may be an announcement sooner than that. 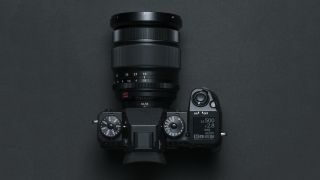 The technological upgrades in the X-T3 are so major that the current X-H1 has been rather left behind, and if Fujifilm is serious about making major inroads into the professional market, it may decide it needs to act a whole lot sooner. Based on Fujifilm's X-T3 pricing, we expect competitive pricing for this camera too, at around $1,800/£1,800 for the X-H2 in body only form.